The Electrical Safety Roundtable’s Social Housing Sub-Group brings together representatives from Social Housing Providers across the country to develop standardised electrical safety guidance for the sector. 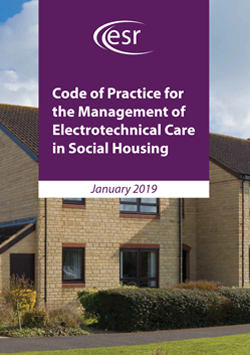 25% of social housing properties do not have the Government’s recommended five electrical safety features (PVC wiring, modern earthing, a modern consumer unit, MCB [miniature circuit board] and RCD [residual current device]) and installed1. 12% of social housing properties failed the Government’s Decent Homes criteria2. 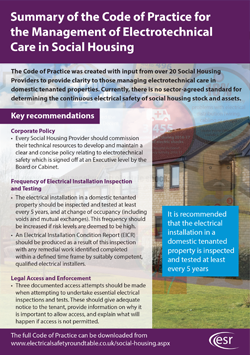 The below documents were created by the Sub-Group to provide best practice guidance for Social Housing providers, and to help tenants to understand why electrical inspections are important. Please use these free to download documents in any way you deem to be useful. •	A recommended frequency of electrical installation inspection and testing. •	Recommendations for gaining access to domestic tenanted social housing properties to undertake electrical inspections and tests. •	How to manage the data compiled during electrical inspections and tests. This document details the key recommendations made in the Code of Practice in a brief, easy-to-read summary. •	Statistics and information explaining the dangers of electricity. •	An explanation of why electrical checks must be carried out. 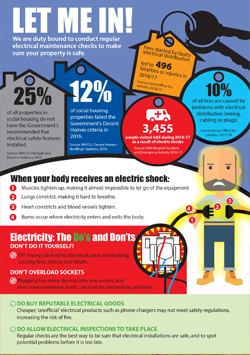 •	Information on what happens during an electrical inspection. If you are a Social Housing provider, click here to download a copy of this leaflet which includes space for your organisation’s details.